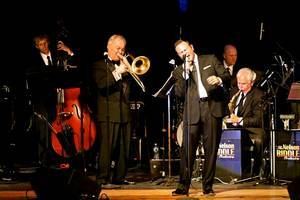 The Nelson Riddle Orchestra under the direction of Christopher Riddle with Bryan Anthony at Birmingham Symphony Hall, Tuesday November 25 at 7:30pm. This was the second visit to Birmingham by the Nelson Riddle Orchestra. Unfortunately, I was unable to attend the first concert they gave, a few years ago, so I made sure that I was available for their return visit, and I was not disappointed. Just before the orchestra came onto the concert platform, the lights in the hall were completely dimmed, so the notes I was hoping to jot down during the evening were not possible. So I can only offer my reflections of the evening. The first thing to say is what a superb disciplined group of musicians the 2008 Nelson Riddle Orchestra are and it is obvious that Christopher Riddle has put in a huge amount of work in seeing that the Nelson Riddle sound that we all love, is continued for those of us who remember the original recordings as well as a younger listening public who may not be as familiar with those great Capitol recordings of yesteryear. One of the highlights of the evening was Christopher sharing his memories of his younger days with us, and his thoughts and reflections about his famous father. He also told us about the early struggle Nelson had in getting together his orchestra and the difficult first years at Capitol until it all came together with these wonderful recordings made with Nat, Frank and Ella. During the evening, the orchestra was joined by Bryan Anthony, an excellent interpreter of the very best of the American Songbook composers. Bryan did full justice to the many wonderful songs he chose to sing for us. Concentrating mainly on the great songs associated with Frank Sinatra, Bryan gave us his own interpretive ideas of how the songs should be sung while at the same time respecting the original renditions. Christopher led the orchestra from the front of the platform contributing his bass trombone and reminding us of the great George Roberts, who became so much a part of the Riddle sound. We were also treated to a selection of purely orchestral items from the band which proved what a great arranger Nelson was. These were all superbly played by these wonderful musicians. This was a very special evening for all of us who attended this concert and we all enjoyed the very best that American popular music of the second half of the twentieth century has to offer, also, the playing of this wonderful orchestra under the inspirational direction of Christopher Riddle. After the concert, it was a joy to meet Bryan and Christopher and to chat with them about he music and the performers. This was indeed a very special evening that will be remembered by all who attended for many years to come. Sinatra Music Society, West Midlands Branch, U.K.